$3.94 shipping continued with an additional 10% off! CG426: Get 10% off your entire order! This offer ends soon so GET CUSTOMIZING! Save Green By Being Green! Today is Earth Day and why not celebrate the day by devoting some time helping out Mother Earth a little more on a daily basis? 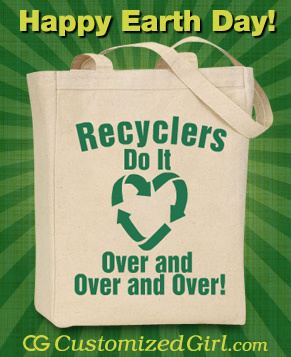 Help eliminate all those plastic bags and paper coffee cups from your life by designing a cute or sassy canvas tote or ceramic mug! Two of our most popular items are now on sale in time for Earth Day. And it doesn’t have to stop there! Check out Earthday.org and your local community to see what you can do outside the home to help the environment. Get the kids outside and involved in the effort! It will be a fun, rewarding experience everyone can share. Just remember that it doesn’t take a lot to really make a difference! Have fun and Happy Earth Day ladies! WOMEN’S TANK SALE!!! NO CODES NEEDED!!! Our most popular tanks are 25% off! Mother’s Day is coming up so order NOW and take advantage of our $3.94 economy shipping! This offer ends soon so GET CUSTOMIZING! Feeling A Little Taxed? We can help! Feeling a little Taxed? Didn’t get the refund you wanted? How about 60% off our best-selling white basic tees! Don’t wait until Monday because this deal is for TODAY ONLY! Customize a template or start from scratch with our junior fit basic or our misses relaxed fit basic! WOMEN’S TEE SALE!!! NO CODES NEEDED!!! Our Junior Fit Basic Tee (now available in 7 colors!) and our Misses Relaxed Fit Basic Tee are now only $11.97! Don’t forget that Easter is April 24th and Mother’s Day is May 8th! Then there is Earth Day coming up, Cinco de Mayo, spring sports (don’t forget group discount), charity walks and teacher’s week. What else? Oh, and don’t forget our $3.94 economy shipping! Customize any of our template designs or start from scratch! This offer ends soon so GET CUSTOMIZING! CG45: $5 Coupon off your ENTIRE ORDER! Easter is April 24th and Mother’s Day is May 8th! With select plush and accessories now on sale with your additional $5 off, it’s hard to pass up creating the perfect personalized gift. Oh, and don’t forget our $3.94 economy shipping! Customize any of our template designs or start from scratch! Valid through 04-11-11. GET HOPPIN’! Recently, one of our fans wrote in to tell us how much she loved her order from CustomizedGirl! 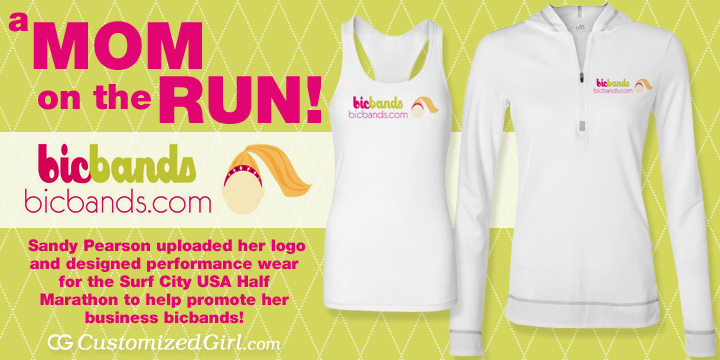 Sandy ordered an athletic tank and 1/2 zip hoodie to wear at the Surf City USA Half Marathon to help promote her business. Sandy is also a blogger, and received several compliments on the tank she wore to the race. To create her unique customized design, Sandy used our super easy-to-use design center to upload her business logo to her tank and 1/2 zip hoodie! With our unique design center, you can upload business logos like Sandy, or you can even upload photos or choose art from our library to create your own personalized design. Be sure to check out Sandy’s blog, A Mom On The Run, “A mom who blogs to help her stay sane!” as well as her Etsy Shop and BicBands.com!